Karbonn is one of the leading native manufacturers of good quality smartphones in the Indian market. 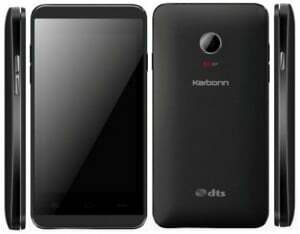 The company has now come up with its new smartphone that has been named Karbonn A15+. The martphone is now available for purchase at an easily feasible price of Rs. 5,890 only. Display: The Karbonn A15+ sports a capacitive TFT touch display of 4 inches that offers a resolution of 480 x 800 pixels. Processor: This smartphone has been powered by a dual core processor clocked at 1.3 Giga Hertz. Operating System: This device functions on Android 4.2 Jelly Bean platform. Memory: The Karbonn A15+ features a RAM of 512 MB and inbuilt storage space of 4 GB. It also provides expandable memory of up to 32 GB by using a micro SD card. Camera: It comes with a rear camera of 5 mega pixels with auto focus feature. Connectivity Features: The connectivity features incorporated in this device are Bluetooth with A2DP, Wi-Fi, GPS and 3G. Other Features: Karbonn A15+ is a dual SIM device with dual standby feature. Only one SIM can support 3G network while the other supports 2G. It also features DTS surround sound, FM Radio and a 3.5 mm audio jack. A lot of applications, such as Hungama My Play, WhatsApp, Kingsoft Office, Flipboard, Opera Mini, etc. have been pre loaded in this device. Karbonn A15+ is available in Silver and Black color variants. Battery: This device runs on a battery of 1500 mAh capacity. Our Take: Karbonn A15+ is a decent low ranged smartphone with standard features. It may become a good choice for budget smartphone buyers as it offers a wide array of applications and services. Furthermore, the buyer gets to enjoy free 500 MB 3G Data with Vodafone for a time period of 2 months. Apple i phone to never stands near to this karbonn.Brand name is nothing functionality important. A good competent for apple i phone. Awesome design too Karbonn mobile have.